Interview with UFO and alien contact experience researcher examines the power of personal experience. Mary Rodwell: The truth is that all we’ve ever got within ourselves is our own resonance to truth, our own BS meter, if you like. Ultimately that is what we’re being asked to trust. We’ve got nothing else. We’re told huge amounts of information. Some of it is disinformation; some of it’s lies. What is it in us that resonates to truth? Ultimately that’s the only thing we’ve got because actually nobody has the full mandate on truth. We’ve all got bits of it and we are fed all sorts of mixes of truth. So the only thing we’ve got in the end is ourselves as that instrument of choosing what our truth is. My role is to facilitate a place where they can find their truth in their experience. Nobody has a right to tell them what to believe around that other than what they choose to believe. 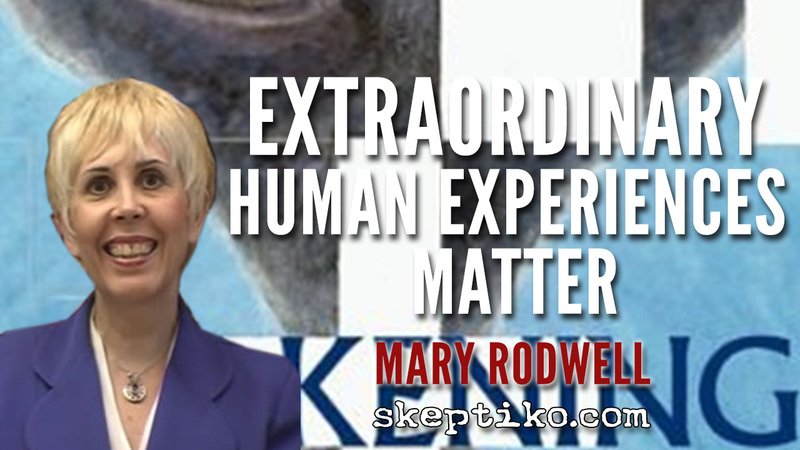 Today we welcome Mary Rodwell to Skeptiko. Mary’s a professional counselor and hypnotherapist, as well as being one of Australia’s best known and most highly regarded UFO researchers. Mary is the founder of the Australian Close Encounter Resource Network (ACERN) where she helps those dealing with the aftermath of alien contact experience. Mary, welcome to Skeptiko. Thanks so much for joining me. Mary Rodwell: It’s a pleasure, Alex. Alex Tsakiris: It’s a big pleasure for me. As we were just chatting about a minute ago, I’ve seen many of your excellent interviews. One thing I have to commend you on is that you’re really very open and generous with your time. You give many interviews to many people. I can see that you’re very committed to spreading this information and you do it in such a great way. I really want to commend you on that. Mary Rodwell: Thank you, Alex. I think that for me it’s about the fact that people are so discriminated against in terms of their own personal experiences to the point of almost anyone that’s out of the box is considered abnormal in some way. For me, it’s the discrimination against personal experience which I think is the hardest thing most of us have to deal with because of the judgment that goes with that. Alex Tsakiris: I think that’s a great way of saying it. As we were just chatting about a minute ago, on this show we’ve looked at near-death experience quite a bit. There is a similar kind of stigma there although that’s much relieved now with the popular media catching onto that. The experience is no longer stigmatized in the same way. But certainly when you talk about people who had such an experience 20 or 30 years ago they say, “I told no one. I couldn’t tell anyone.” That certainly is a situation that you’re familiar with when we talk about close encounter or alien contact experiences. Before I get too far along, for folks who are less familiar with your work can you tell us a little bit about yourself and how you got started doing this work? Mary Rodwell: My background is nursing. For a number of years I practiced my profession there but I went into professional counseling about 25 to 30 years ago. I’ve done the whole gamut, from relationship counseling to grief and bereavement, through a whole range of what we call the more expected normal human experiences. It was that scenario that brought me into this and I was grateful for. As synchronicities would have it, I’m one of these people that have always read anything that’s unusual. If it’s weird and wonderful I’ve read about it. If it’s something weird I’ve got a book on it, you know? Unfortunately, because of that I’ve always been more open to the mysteries, as I call them, in life. Fortunately I’d read two books prior to this only a few months prior. One was Dr. John Mack, who is the former Professor of Psychiatry at Harvard University who wrote Abductions: Human Encounters With Aliens and also Communion, Whitley Streiber’s book, who wrote about his own personal encounters. I’d read those so when this gentleman came to me I was intrigued. He was obviously very grounded. He was very articulate. To me there was no question that this was happening to him in the way that he described it. I was doing advanced counseling at the time at the Wasley Institute and I actually took him as a case study, which I felt was very brave to do because I thought people would think Mary’s lost the plot, as they say in Australia. What was interesting was that there was a United minister, social workers, and a whole range of professionals. When I presented his case I thought they were all going to say, “Mary, he obviously needs to see a psychiatrist or whatever.” But what they did do was they started to tell me about their own unusual experiences. It was fascinating; it was like I’d opened the door for people to say, “Well actually, these kinds of things happen to me,” or “I’ve had things I can’t explain.” So in a sense it was a real clue to think so what else is out there? How many other people don’t talk about certain experiences because they’re not okay? But what it did do was say how limited psychology was in terms of understanding the greater reality. We’re got to start seeing it as a dysfunction rather than the fact that we don’t all fit into that box that says unless you can touch, feel, and see it it’s not real. In fact, there’s a whole non-physical world and now we are actually experiencing it on many levels. All of us have done this at some point or another. Alex Tsakiris: There are a couple of things you’ve said there that are really interesting and different so I want to break them apart. One is you referenced John Mack. That is someone who I often use as an entry point for people who are unfamiliar with his work. He is so credible, not only in his credentials but in the way he comes across. Of course, he’s no longer with us and died in an accident a few years ago. I don’t know how anyone can encounter John Mack and his research and come away from this without being intrigued to look further. So I think that’s a great starting point. The other thing that you mentioned, and I’ve picked this up from some of your other presentations, that I think is a really profound point that you make is that we have to start thinking about consciousness in a much broader sense. It seems to me that a lot of this work that we’re talking about in these other areas like I mentioned, near-death experience, hallucinogenic experiences, remote viewing, out-of-body experience, all these things point to this larger consciousness that is available to us. What I hear you saying is, “Come on, people. It’s obvious by now. Just follow the trails. We’re talking about a much bigger kind of experience that we have to get our arms around.” How do we begin to do that? What are the limits of that, too? That’s challenging. When the tent gets too broad then we start getting into a lot of stuff that starts making all of us a little uncomfortable, that we’re not staying grounded in what we really do have the best data on. That was a long, long question but maybe you get where I’m coming from on that. Mary Rodwell: I think everything you’re saying, Alex, is absolutely right. What I’ve found as I’ve gone down the—as they call it—rabbit hole is the more you go down the rabbit hole you realize how little we know about reality. The truth is that all of us have experiences out of the box. The feeling like someone’s going to ring; the knowing that it’s not a good day to do a certain thing and then you have that confirmed. Alex Tsakiris: Don’t get on that plane, and then the plane crashes, right? Mary Rodwell: That’s right. Those feelings and knowings that we get that we can’t quantify with our left brain but nine times out of ten are accurate, totally accurate. We dismiss them because we can’t quantify them through our left brain. But the truth is that is another part of us which I call “consciousness.” It’s way beyond our physical container that gives us information if we listen to it. That’s what people who are psychic are doing. They’re honoring that other part of them that perceives things out of the box. I meet people all the time that say, “Mary, I see energies around people. I see colors around people.” They may say, “When somebody’s sick I know what it is. I can feel what’s going on for them.” Clairvoyants, as we know, see spirits. Or those that see orbs flying around that we can get on cameras now and what-have-you. So is this all an aberration of our reality or is it in fact these people telling us more about what our multi-dimensional reality is? Because it isn’t a third-dimensional reality. We know now that a lot of these things can even be understood through quantum mechanics or quantum science. We’ve been told the possibility of dimensions and parallel universes and the expanding universe. So all of this, in a way, is the new science. It’s actually quantifying how we work in this kind of a way where we can tap into consciousness itself. We’re getting the clues from science itself and this is what people don’t get always. Those in the old paradigm say that unless you can touch and feel it it’s not real. All of these things are really saying the same thing. Alex Tsakiris: That’s a topic we’ve talked about a lot. There’s actually another layer to materialistic science that insists that everything should be measured. The other layer is really it’s been falsified by the best science that we have that suggested that that’s not really the way it is. I think that quickly gets into why are things the way they are? Why do paradigms remain even after they’ve been falsified? That’s a whole other topic. So a few months ago we had an opportunity to talk with Dr. Janet Colli and she’s a clinical therapist. You might know her in the Seattle area of the U.S. She’s done a lot of work with people who claim an alien encounter that’s caused trauma in their lives. They come and see her as a therapist. She’s come to a lot of the same conclusions you have. In particular, that essentially the core of these alien contact experiences—we can only dance around that so much. At some point we have to say that’s what we’re talking about here, folks. And we are, as uncomfortable as that is for some people to really grasp. If you really dig into the research there’s a reality to it that is hard to look away from. The data is just so overwhelming that this is really happening. I digress there for a minute. Dr. Colli comes to the conclusion, as you do, that these are essentially sacred encounters, spiritual encounters, spiritually transformative experiences. One of the things I was really hoping we could do—and I don’t know if we can do it completely in this interview so I want to set it up as something that if we find a way down the road to engage in this as a project—and that is to juxtapose the sacred alien encounter with the other major alien encounter paradigm that’s out there and that is from Budd Hopkins, deceased, and his research partner who is very active, very much alive, and very highly respected. Dr. David Jacobs is formerly of Temple University, a historian, and someone who’s done a lot of research in this area. I’ve corresponded with him. We’re setting up an interview with him. His conclusion is very different. His conclusion is that these are not sacred encounters to the extent that we perceive them to be sacred encounters. We have to be very careful that we’re not being deceived and that there is a much more malevolent agenda at foot with these encounters. So that’s a huge area. Let’s begin to pull that apart. As much as you’re comfortable doing so, tell me your big-level picture of what the difference is there and where you think the evidence stacks up. Mary Rodwell: That’s a big one. For me, the trouble is that it’s so complex and so multi-layered it really depends on what level that you’re exploring this. If you go into, for example, a hypnotherapy where the person is just exploring the scenario which for many of those coming in on this will only do that. They will actually see the person on the craft, they will see the person perhaps having procedures done and that confirms the scenario that yes, you’ve been taken. You’ve had a procedure done. You’re not aware that this is something you’ve consented to. How terrible. This is often the level where it stops. From that it’s understandable that you would interpret that and the person would interpret that as something that is negative and certainly unethical and all those kinds of things. But if you take it to another level–and there is another level that you can work on within hypnosis and that is to find out why. The way that I have worked and those that work on deeper levels is that you’re actually accessing what I call another part of that person. It’s not just the subconscious. For want of a better term we call it the “superconscious,” or that part of you that knows. It’s the part of you that knows when somebody comes to the front door that that person is someone you can let in or someone you want to keep on the other side of the door. There’s a knowing that is a positive encounter or not a positive one. What you can do in the process of hypnosis is to ask questions of that other part of them. It can be done via communicating with the being that’s in the room. They may say, “Oh, they’re taking genetic material,” or they may be doing a healing but you didn’t realize what they were doing. Or they’re telling the information of why this needs to be done. They can say yes or they can say no. But usually it’s that it makes sense even though it’s strange. Nine times out of then they will say yes even though it’s difficult and it’s been traumatic. I understand that. I have to say that his response wasn’t too positive. He decided it was time to leave the lunch, and I will leave it at that. I know that Budd has always felt that no matter how positive people will say their experience was, he would say they’re being manipulated. There’s nothing you can do if a mindset is I’ve decided that it’s all negative. Or I’ve decided it’s all positive. For me, I don’t know other than my role as a therapist is to help people have an understanding of their experience. How they choose to understand it is their choice. It’s not for me to say, “Well, that’s good,” or “That’s bad.” It’s for them to decide through the process of what we’ve done whether or not for them this makes sense and whether or not this they feel has become a positive experience for them or not. There is no point of judgment from me because then I’m not an objective researcher. But what I am saying is that nine times out of ten this ultimately becomes transformative and the patterns of that happening are over hundreds and hundreds of people. I’ve worked with over 2,000 people now and with the ones that are the most traumatized there are two reasons I’ve discovered. One is because they have had human interactions with military which are very negative, at which they are made to believe is actually ET when it’s not. Now anyone outside there can say, “Oh, they’re wrong. They’re being misled,” or whatever. The truth is that all we’ve ever got within ourselves is our own resonance to truth, our own BS meter, if you like. Ultimately that is what we’re being asked to trust. We’ve got nothing else. We’re told huge amounts of information. Some of it is disinformation; some of it’s lies. What is it in us that resonates to truth? Ultimately that’s the only thing we’ve got because actually nobody has the full mandate on truth. We’ve all got bits of it and we are fed all sorts of mixes of truth. So the only thing we’ve got in the end is ourselves as that instrument of choosing what our truth is. Everyone has the right to however they interpret that. My role is to facilitate a place where they can find their truth in their experience. Nobody has a right to tell them what to believe around that other than what they choose to believe. Alex Tsakiris: I really, really appreciate a lot of things you’re saying there. I think it’s fantastic. I want to pick up on a couple of them and get your thoughts. One is you said that we cannot necessarily put too much emphasis on the trauma. That may not sound right but I guess I’d relate it to the Shamanic experience that we know about through cultures. It’s often a very traumatic experience and it’s even understood to be a traumatic experience. You don’t choose to go through that but you go through it and it’s for your own good. There are some folks that would not be inclined to go there and think that might be a little bit too generous in terms of ascribing those kinds of motives to this contact experience. What do you think about that? Mary Rodwell: I think it depends on what level you’re looking at your life. Let’s face it—there are lots of things that happen in our lives that seem unfair. “Why does this always happen to me? Why did I have such a terrible childhood when other people have lovely childhoods?” We can look at the how life is unfair for so many people. People are starving in Africa and what-have-you and it makes no sense. Why do some people have a beautiful life and others have a traumatic one? Well, it’s the big question. The only answer that I got by working with people on deeper levels and by working with people that were looking beyond the norm is that I’ve come to believe that we are on a soul journey. We have chosen, if you like, certain experiences in our lives that enable us as a soul to grow. For each one of them it’s different. For some of us it will be perhaps experiencing limits like starving in Africa or whatever. For some of us it may be learning about compassion or learning about non-judgment or whatever. I’ve asked, “Where is the free will then in that other than our soul has chosen that?” The free will is in our attitude toward it. Do we see our difficult experiences as victims or do we say through that experience, “I’ve gained so much insight into compassion or into empathy or into how I cannot judge anymore.” So as a counselor and as a therapist I’m always with someone, offering them a chance for a different perspective on whatever’s happened so that they can let it go and heal. This is the same thing again. I do believe that not all people that have these experiences are traumatized. Only about 30% are traumatized; 70% are not. Many are traumatized by being on a planet that is barbaric and primitive. They say, “I don’t like it here. I know I’ve got something to do. My interaction with the beings is totally loving. They’re my family and I feel like I’ve been dumped on this very primitive planet.” Now that’s about 60% to 70% of those that contact me. The other 30% may be traumatized and I believe like Janet does that this is, for some, a modern-day Shamanic experience where they are asked to transcend their fears and go to a new place of awareness and understanding, which the Shaman has to do. He or she has to transcend their fears to go into and experience other realms. If they haven’t overcome their human fears they can’t operate in a multi-dimensional reality. This is where I feel we’re going as a species. Alex Tsakiris: Now, Mary, do you think that perhaps this is why Hopkins and Jacobs have gotten a different message? I think they’re coming at this from a Humanist, non-spiritual, kind of academic there’s only this kind of existence kind of perspective. Do you think that worldview is shaping a little bit what they’re getting? Mary Rodwell: I do feel that. I feel simply because if you don’t take in the spiritual component you’re missing the most vital part of who we are. Most people acknowledge that we are not just a physical container; that we are Spirit and the spirit is our consciousness. And it’s our consciousness that animates our physical body and drives the journey on this planet. But that isn’t, as I said, all of who we are. We are here, spirit-souls, having a human journey and we’ve chosen our container for that journey because we can’t just be light here. We have to have some density. Until you go to that point, everything is about what’s being done to you rather than actually taking part in the fact that you may actually be the pilot of your own journey, even if you don’t always remember that particular fact. That’s part of the awakening, for us to realize that we are actually pilots in our own journey. We are part of what we create as ways of the soul gaining information and experience. That’s how it makes sense to people. Alex Tsakiris: Let’s look at this through another lens because I’m inclined to agree with you on Hopkins and Jacobs. I think they’ve brought a lot of valuable insights to this. They’ve been pioneers. I really look forward to fully exploring Dr. Jacobs’ perspective on this and giving him a fair shot at it. I really do respect and admire his work. But let’s say I’m with you on the fact that if you are predisposed to not look at or downplay the spiritual aspect of this, you might get a different look at it. Let’s switch over for a minute. I want to talk about it from a transformative spiritual experience perspective. I told you I’ve worked a lot with NDE researchers in trying to understand what’s going on there and the reality of the phenomena, which at this point is firmly established. Anyone who doesn’t think that’s a reality just doesn’t know the data and hasn’t done the research. The second part of it, which is more challenging and it’s the kind of stuff we’re talking about here, is what does this mean? What can we really understand from these accounts? I don’t want to go too far with that because I think that’s dangerous. It is like the alien encounter accounts. They quickly go in a million different directions. It’s hard to find some central themes. But if I was going to compare the central themes and ideas from the near-death experience to the alien abduction experience, there are some unresolvable for me issues there. In the near-death experience there isn’t any trauma, really. There isn’t the kind of trauma we’re talking about here. There isn’t the deception at all. We have to acknowledge that there is a deception in the alien encounter. There’s this mind control thing; there’s this forgetting thing. I don’t remember any of it and six months later I see something on TV and it triggers me and I’m falling apart. There’s none of that. There also isn’t the technological component of it, which is so intriguing about the alien encounter. There’s a lot of technology with that, too. And again, the near-death experience totally transcends that. It says you are a part of this soul-group. You are a part of this whole, part of this divine—people don’t like the term God. It’s all those things and it comes through consistently. What do you make of the differences between some of these other spiritually transformative experiences like near-death experience and the alien encounter experience? Mary Rodwell: One of the things that I needed to do was look at the patterns of the whole thing to do with contact, as I call it, from what appears to be the abductions to those that say, “I’ve never experienced that. I’ve only experienced loving encounters.” So first of all, why is that? Why do we have some that are traumatized and we have some that are not? Just like we ask, “Is an apple tree a good apple tree?” Well, the apples are great apples to eat. The apples in this ultimately seem to be transformative. People have heightened awareness; they become more aware of a greater reality. Many of them turn away from materialistic values. They change their diet. Many become healers. They become more sensitive in terms of the world around them. They literally change in dramatic ways. Now you can say, “Well, is that a good thing or a bad thing?” Well, let’s face it. So far, from what I’m seeing, they feel more connected to everything. Many of them feel like they’ve got a mission to do good in the world. So if whatever this experience is is actually altering people’s mindsets into a more holistic, caring individual that’s far more sensitive, to me that’s the evidence of ultimately this experience. The near-death experience may be different and I think the soul chooses whatever wakeup call it wants. What’s really interesting is that those who believe something really negative has happened to them, for example, when I’ve taken them into the experience what they discovered was nothing like what they believed. They will say, “I was being taken over,” and when I’ve actually taken them to that point and saying, “Are you being taken over,” they’ll say, “No. Actually, they’re giving me information.” So we come from fear, we fear the worst, and we don’t always know exactly what it is until we’ve gone into that. This is what has blown me away because I’ve worked with people with trauma. I thought, ‘I’m dealing with people with trauma. They’re having this terrible experience. Some of these beings are coming and doing all these awful things.’ But what I’ve found was there are certainly some self-serving ones, I suspect, but on the whole it seemed to be actually so much more than that. I can only look at the patterns. I can only look at the data. That is my research. It’s not me wanting one outcome or another. I can’t do that because I don’t know what I don’t know. So all I can do is look at the patterns and see the outcomes. The outcome primarily appears to be a totally transformed individual no matter what the journey was to that point. Alex Tsakiris: Mary, you work with folks all over the world. Tell us a little bit about your organization, Australian Close Encounters Resource Network and tell us how folks can get in touch with you if they’re interested in exploring this with you personally. Mary Rodwell: It is just the website, www.acern.com.au, but if they Google my name it comes up anyway. It’s very easy to find me. I’m having my website updated as we speak because it’s gotten very archaic, so it will be even easier for people to access the information with links to interviews and everything else. But it’s really, really easy. Alex Tsakiris: You’ve done some fabulous work on this. We’ve spent almost an hour here on this Skype call so I want to wrap it up, but I definitely want to leave open the possibility that we can reconnect. In particular, I’d love to have you back on after I talk to Dr. Jacobs. The real plan I have in the back of my mind is to see if there is some way we could do some kind of collaborative effort between these two camps to try and move this forward. I really feel that there are a lot of people out there that want to come along on this journey. They’re open-minded enough not to dismiss it out of hand but they’re still skeptical. They don’t directly have an experience with this and they really want to see someone hash this stuff out in an intelligent way. So is that something you think you might be interested in joining me in? Mary Rodwell: I would love that because there’s one thing anyone with a different view can do and that’s to actually say, “I don’t want to hear anymore,” and decide to leave the lunch. So I’d like to do that. Alex Tsakiris: Awesome. Mary, it’s been great having you on. Thanks again so much for joining me. Mary Rodwell: It’s an absolute pleasure, Alex.